Not All Squats Are Equal! Not All Squats Are Equal! Not All Squats Are Equal! I have worked out since I was 14, that’s almost 30 years of doing tons of different programs, variations of movements, training tools, and just about everything there is to do with working out. Trust me, there have been more mistakes than I can probably even remember, but I try to learn from each and every experience. That is why it can be hard to convey to people what we teach in DVRT. We don’t teach “sandbags”, I try to bring those 30 years of lessons to you! One of the big ones is about re-thinking the most classic of exercises. Being 6’4, having a pretty bad spine disease, not being particularly athletically gifted, often made it difficult for me to excel at what some would say are the “basics”. In fact, when I recently did a training for an Equinox the manager and I got to talking. She was in great shape and I asked her what she liked to do. Bodybuilding use to be what she enjoyed doing, during that time she suffered a bad low back injury herself. Her biggest concern was that she wouldn’t be able to accomplish her goals because of this injury. Specifically, she told me she was worried because she couldn’t back squat anymore. It was a good lesson for her to realize that she didn’t have to back squat to build muscle and get strong legs. Even cooler was she didn’t jump into machine training like many would probably feel compelled. She realized there were many ways to manipulate a movement to stress her body without hurting. I think both of our situations and experiences bring to light the different between a movement and an exercise. We focus a lot more on movements than exercises because if you understand the role of movement in training you can have literally thousands of exercises. However, if you have an understanding of only a handful of exercises you quickly become really limited in the results you can achieve. That’s why in DVRT we have so many different exercises of a movement like squats. While most would chalk squats to just being an exercise to “work the legs” the reality is that we can can see the squats so much more if we look a bit deeper. 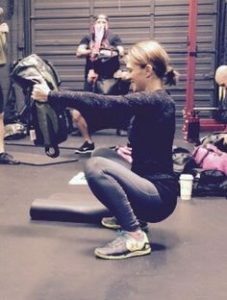 After all, there are many ways to “work the legs” like Jessica wrote earlier this week (you can read HERE). Squats are a movement pattern first and foremost and that means we want to think about how the body moves, not just what we lift. Our goal in DVRT is to get as deep as possible and our strategies often allow us to accomplish just this! But why do we want to do this? -Mobility: The deeper into squats we can go the more mobility we achieve in the ankles, knees, and hips. These three areas are important for reducing our incidences of low back pain, but thy are also responsible for making us jump high or run fast. Whether you want to feel good or perform at your highest level, it is important to have mobility in these three areas. -More Glutes & Safer Knees: Squats still somehow get the reputation of being a “quad exercise”. That’s largely because if we don’t break parallel to the ground then yes, it is actually far less hamstrings and just as importantly glutes! Isn’t that bad for your knees? Well, considering most countries where deep squatting is still part of their culture have lower rates of low back pain might be our first sign of no! What about the knee though? Because the deeper we go we get more hamstrings and glutes, this is actually what helps us protect our knees. Don’t feel bad if you fell for this old fitness myth, a lot still do. How do we achieve the goal of using squats to get stronger, more muscle, move better, and perform our best? That’s where I believe our DVRT squats give such great advantages. 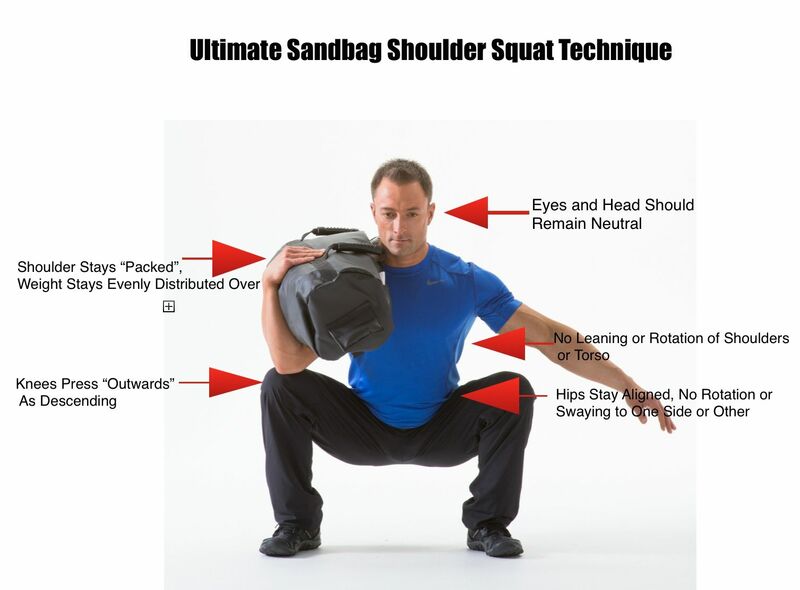 By using the Ultimate Sandbag in strategic ways we transform squats from a “leg exercise” to a full body one! DVRT squats teach how to create tension, proper movement of the squat, and how to connect our body so even someone who appears to be limited can hit a deep squat from almost day one! No, this is not hyperbole, but what we have seen time and time again. Even this woman who couldn’t squat because her knees hurt so bad. Guess what? We taught some of these ideas and she did her first pain free squats in years! Don’t worry! If you are concerned about not getting strong. Study after study shows that we can get equally strong with the load in front of our body that we do with the weight on our back, but guess this….usually with way less weight! Best of all, we actually connect our core to our legs so the strength we develop in our DVRT squats carries over better because in the real world our leg strength is totally dependent upon how strong our core is to stabilize our pelvis. Thanks to thoughtful coaches like Joe Sullivan, you can see how we can use Ultimate Sandbag squats from everything from challenging core stability, building mobility, and yes, creating serious real world strength! Find out more about how DVRT changes the way you train! Save 30% on ALL DVRT Workout programs with coupon code “thanks” HERE!